Hi loves! How have you been lately? Enjoying your weekend so far? I am going to dinner with the boyfriend tonight, yay! 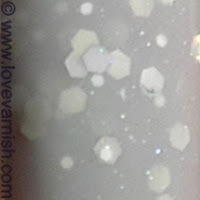 Today I've got 6 El Corazon polishes to show you. I've showed the Easter Eggs collection recently and these are also one of the "Egg" collections, this time called Souvenir Eggs. The collection isn't as consistent in its theme, there is a variation in glitter color and size going on. All swatches are with 1 coat of Essence Better Than Gel Top Sealer, except the first one.. I forgot topcoat there, sorry! It did feel smooth though. All the others felt completely smooth too with topcoat. The first one is 423-103. 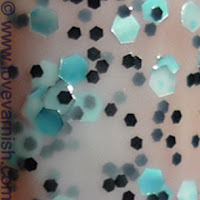 This is a very sheer blue jelly base, filled with small black hexagonal glitter, and large blue and silver hexagonal glitter. It applied quite okay, you do have to let the coats dry in between but the glitter didn't clump, it spread easily. All nails but my ringfinger show 3 coats on it's own, my ringfinger is 2 coats of Hema Pastel Blue and 2 coats of 423-103. I liked it better when layered, because the tint of the base isn't very appealing to me when build up alone. Next one, 423-104. This one is a semi-sheer white base, small black hexagonal glitter and shreds of holographic glitter. Application was again fine, nothing special but not bad either. 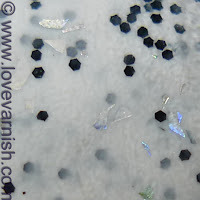 The base wasn't opaque enough to stick with 2 coats, but too opaque to really give the holographic shreds room to play. Maybe if you layer 1 coat over an opaque white base the shreds will look prettier. Third polish, 423-105. My personal favorite! A soft and sheer grey jelly base, filled with holographic microglitter, small white hexagonal glitter and large holographic hexagonal glitter. I used 3 coats and it applied well, spreading easy and covering evenly. Even though the holographic nature of the glitter doesn't really show, I love the looks of this one. It's soft, it is like sunshine peeking through big puffy grey clouds on a rainy day. Fourth in the collection, 423-106, a soft green base filled with small black hexagonal glitter and large holographic hexagonal glitter. This one was good in 3 coats, it applied the easiest of all, easy spreading and a nice flowing formula. I think many of you will like this one! Number 5 is 423-107, the pink version of 423-105! 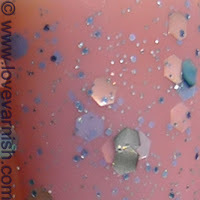 A sheer pink jelly base filled with holographic microglitter, small white hexagonal glitter and large holographic hexagonal glitter. It applied easy, but the pink base was a touch more prone to patchy parts. I did find it more sheer too so I layered 2 coats over 1 coat of OPI Pedal Faster Suzi on my ringfinger, the shimmer in the OPI really complimented the El Corazon! Other nails are 3 coats of the polish by itself. Last one for this collection! 423-108 is a light purple base, again very sheer and jelly like, with blue microglitter, and silver, blue and pink large hexagonal glitter. I wish I layered this one over something on one nail, because it is so sheer in these pictures! It wasn't as noticable in real life though, but macro doesn't help. I really like the blue microglitter, it is a fun addition. 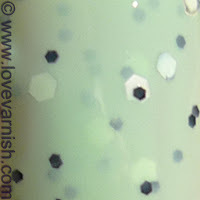 Somehow it also reminds me of Deborah Lippmann Glitter in the Air. Application was fine, slightly clumping but nothing major. Which one do you like the most out of these 6? Please tell me in the comments! They are fun, aren't they? Thanks for the comment! Aww that is so sweet! Thanks ♥. I did! The food was soooo good, and we had a great bottle of wine. Yes the first one is awesome when layered. Glad you like them! 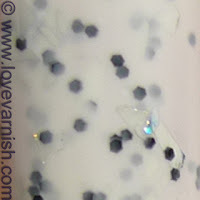 The grey one reminded me of Illamasqua Raindrops. Which I don't have. This would make me just as happy though. The last pink one is nice too, but wow that grey one is stunning!